In July 1993, President Clinton asked banking regulators to reform the Community Reinvestment Act. The reform helped increase lending and extended basic banking services to the inner cities and to distressed rural communities. 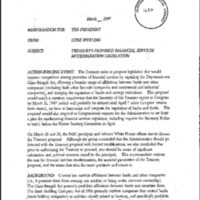 In 1998 the Clinton Administration strongly opposed the proposed Financial Services Act (H.R. 10) and argued that its financial modernization provisions undermined the Community Reinvestment Act. 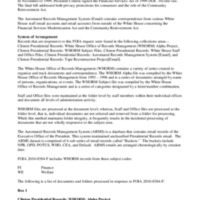 In November of 1999, President Clinton signed the modified Financial Services Act of 1999 (H.R. 10) into law. The final bill addressed both privacy protections for consumers and the role of the Community Reinvestment Act. The collection consists of clippings, correspondence, emails, memoranda, statements, and talking points.